I just can’t get enough of Vietnam! I took a sleeper bus to the town of Phong Nha; which was pretty much my number one reason for going to Vietnam. I wanted to see the spectacular caves that I had heard so much about. I ended up staying at Easy Tiger, a popular hostel in town that looks more like a beach resort where almost everyone ends up staying as the bus stops right across the street from it. Every morning they offer an overview of the area and all of the possible tours that one can take inside and outside of the park, including the ones that Oxalis offers. Oxalis is the only company that has experienced cave guides and that works with the British Caving Research Association to plan/organize all caving trips in this area. 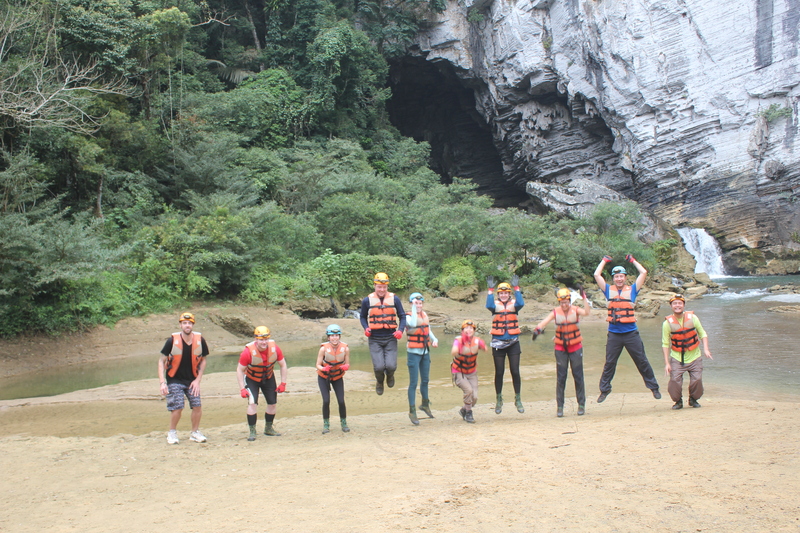 The first day I joined a group of people from Easy Tiger to visit the two most popular caves and the cheapest/easiest to access- the Phong Nha cave and the Tien Sun cave. The first one is a wet cave only accessed by boat and the second is at the top of a mountain right next to it and is reached by hiking up a long and steep set of stairs. 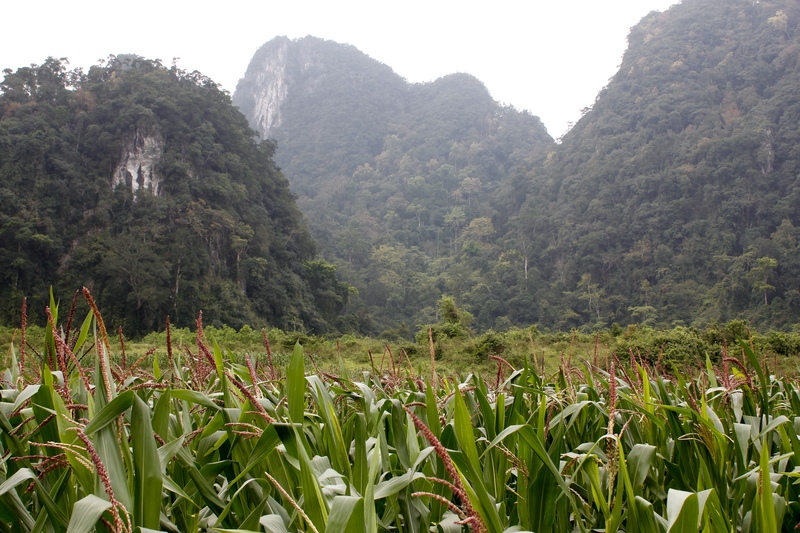 The white marks on top of the Phong Nha cave’s mouth are scars from bombardments from the Vietnam war. 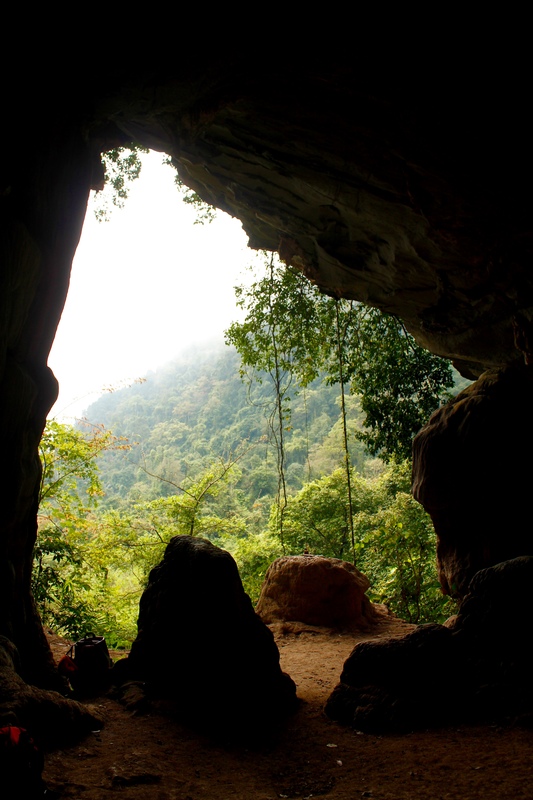 The North Vietnamese soldiers used the cave to store arms. Afterwards we rode bicycles out to a farm house where you can choose, kill and pluck your own chicken; which is later grilled. Two guys volunteered to chop the chickens’ heads off one by one. It was hard to watch. The chicken tasted very firm, not like any chicken meat I’ve ever had before. On my second day, I joined another group tour to visit Paradise Cave and Dark Cave. 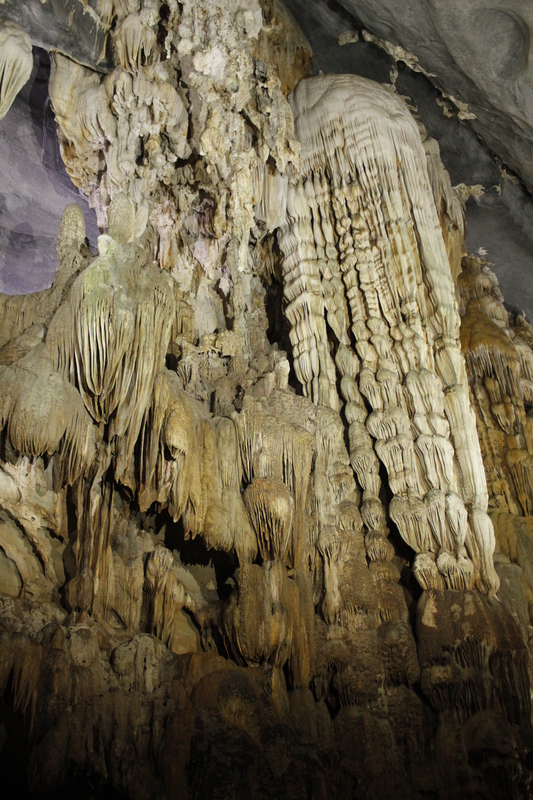 The cavers that discovered Paradise in 2005 thought that the cave and its stalagmites/stalactites were so beautiful that they called it Paradise. 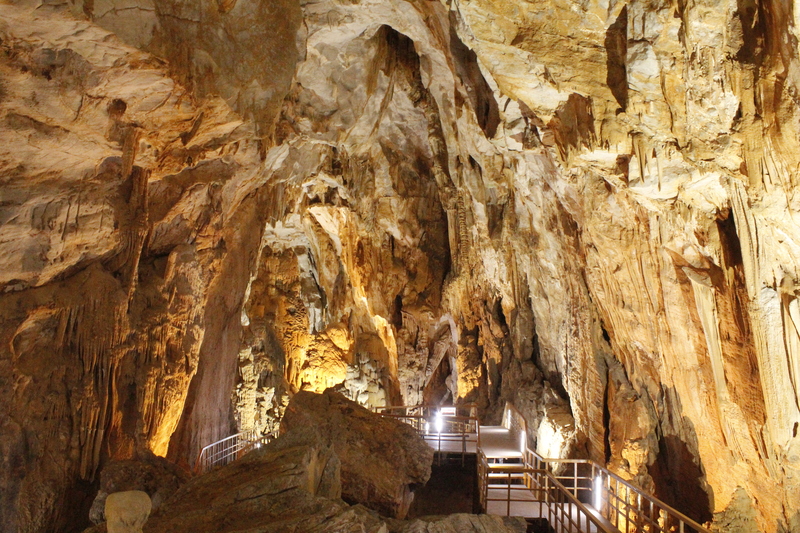 This cave only opened to the public in 2010 and it is 31km long. 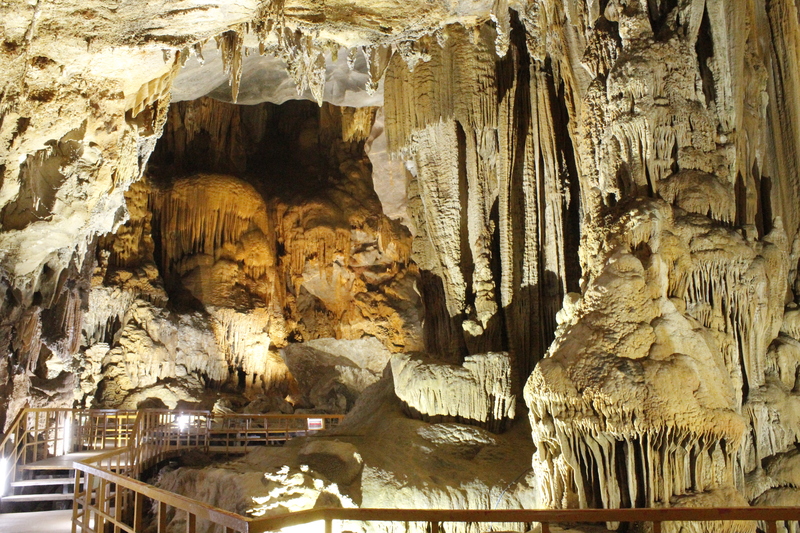 Unless you join a caving trip with Oxalis, you can only visit the first kilometer. This short distance is enough to give you a good feel for its sheer size and its mesmerizing beauty. Next we visited Dark Cave with a headlamp traversing through a narrow passage until we reached a mud bath. I forgot to take my gopro but it was so dark that it would have been hard to get any good pictures. The mud bath was really fun. I highly recommend this cave. 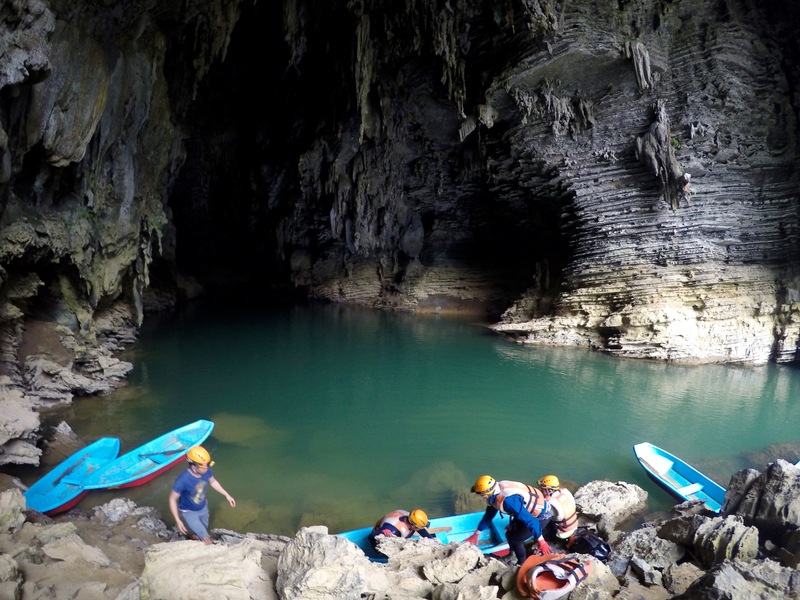 It only takes about 1 hour to go through the whole experience including the zip lining and kayaking before and after the cave. After seeing these spectacular but very touristy caves, I still wanted to see more. 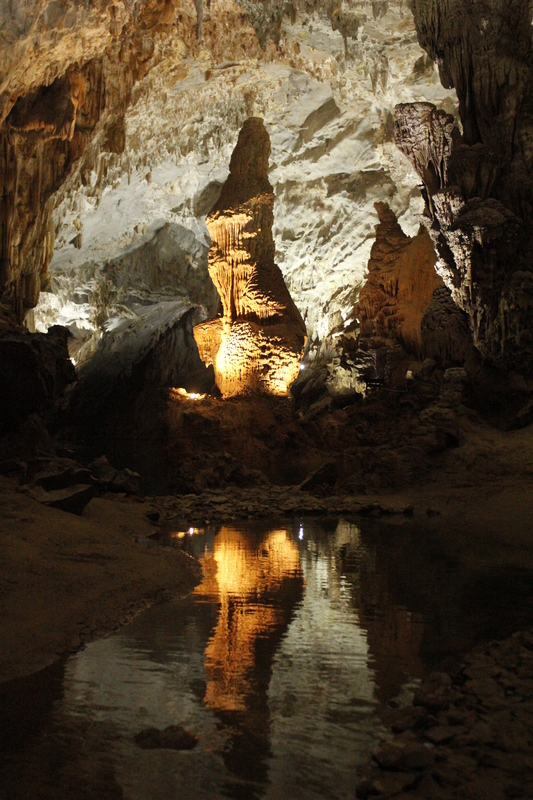 I wanted a more “real” caving experience so I opted to do a rather expensive trip (but oh so worth it!) 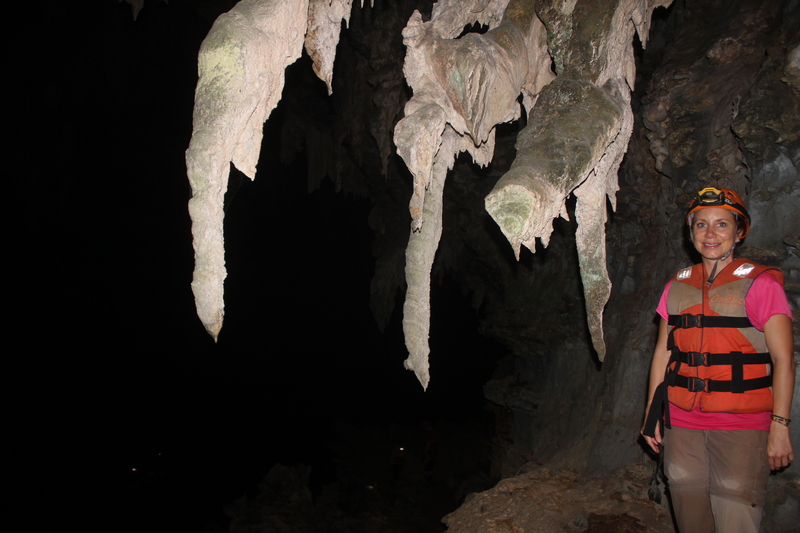 with Oxalis to visit the Tulan cave system. We had two amazing days exploring the jungle valley, Tulan, Ken, Kim and Tohan caves. 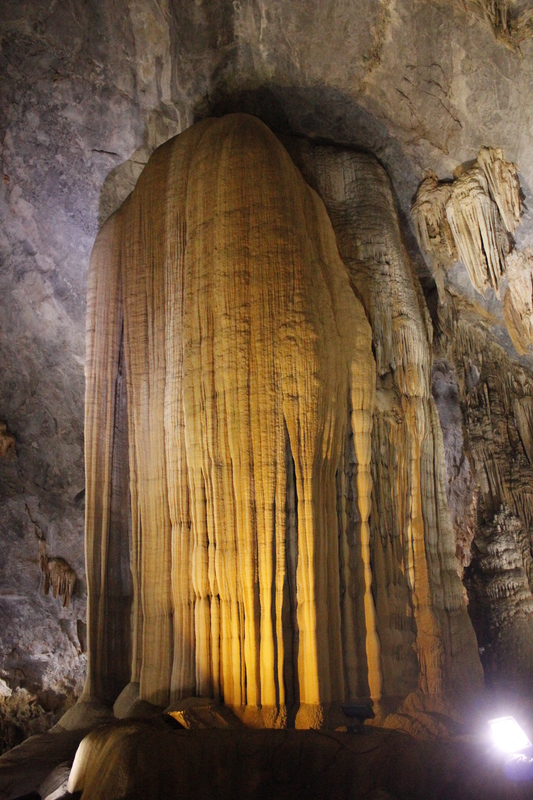 Water drips from the ceilings of the cave and deposits various minerals, usually calcium carbonate in a limestone cave; which accumulate to form a stalactite (coming down) and/or a stalagmite (rising up). It takes about 1000 years for these to grow a centimeter so it is pretty important not to touch these to avoid interrupting the process. We saw spectacular formations inside the caves like a column flow (when stalagmite and stalactite meet) that was 110 million years old, and a snail fossil that was 450 million year old. We saw a few big stalagmites in the process of forming, in other words, with the water continuously dripping right on it. We were also accompanied by some big spiders, centipedes, and bats through our journey. 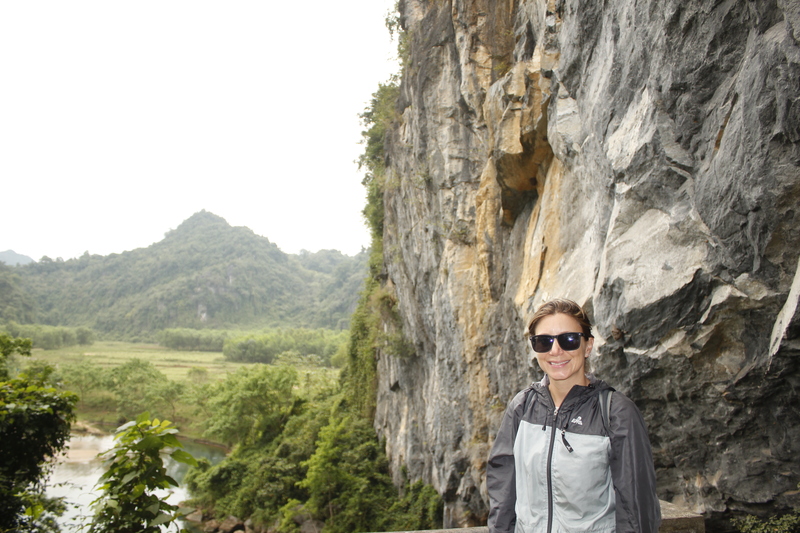 There was a lot of fun hiking in muddy slippery, jagged limestone terrain, climbing in all fours along the cave walls, going through some narrow passages, and lots of swimming in the dark. We also had to climb up a 15m (45ft) ladder to get out of the last cave. a famous stalactite photographed for one of the National Geographic covers. Another interesting place in Vietnam are the Vinh Moc tunnels located in Quảng Trị province; on the north shore of the Ben Hai river in the Demilitarized zone; which separated North from South after the Indochina war. Ironically this demilitarized zone was one of the most bombarded during the Vietnam (American) war. 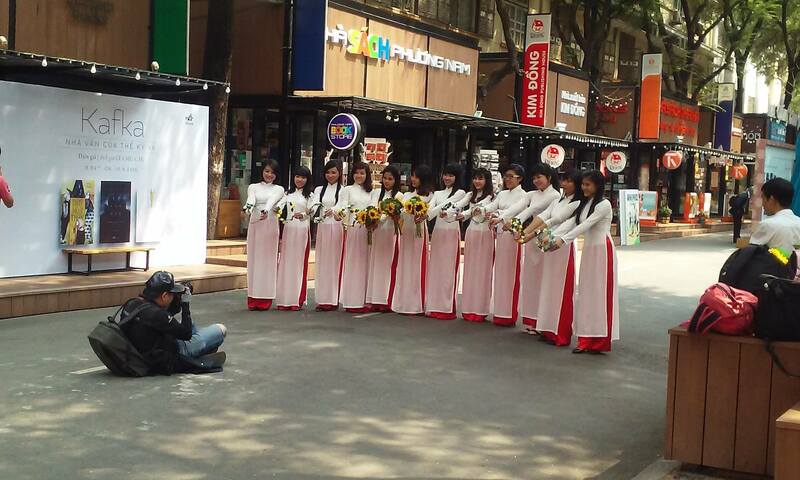 The villagers from the area used to help the North Vietnam aka. 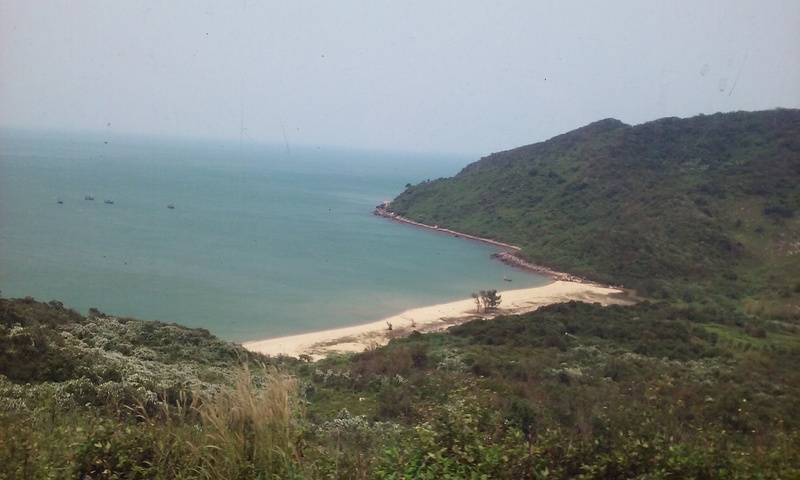 Vietcong armies positioned on the Con Co island, 28km from here on the sea. The Americans wanted to force the villagers out but they instead responded by building these tunnels to protect themselves. Vinh Moc tunnels are one of 114 tunnels built during the war (many collapsed). The villagers took twenty months to build these. There were three levels; the first level was 12m deep for housing soldiers, the second level was 15m deep for the local people and the third level was 23m deep for warehousing weapons and sheltering the locals during bomb attacks. Around 360 people lived here permanently during six years (1966-1972) but the tunnels housed up to 600 people during peak bombing times. The most impressive story was that 17 babies were born inside the tunnels. These tunnels were built on a hill and slanted towards the sea so the water from rain could drain out avoiding flooding. During the war the locals would farm outside, in between bombing raids, but the vegetables grown were not enough to feed everyone so the North would supply the rest. The tunnels also served for protection of the North Vietnamese soldiers and to store weapons and other supplies to be sent to Con Co island. Suicide squads would move supplies from the tunnels to the island by boat in the middle of the night. we walked through the narrow tunnels. The Vietnamese flag at the DMZ. In 1967, the flagpole was replaced 11 times and the flag 42 times due to US bombardments. 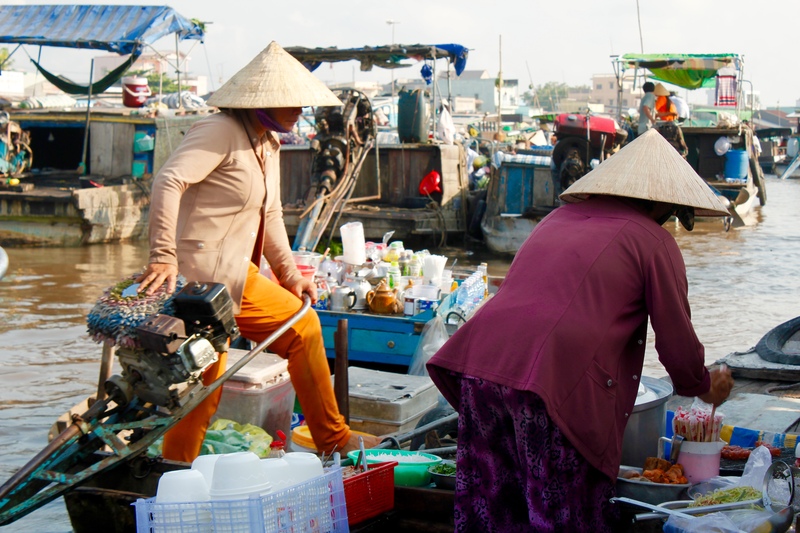 Huế is a beautiful city that I almost skipped but decided to visit after watching an Unknown Parts episode where Anthony Bourdain talks about its culinary delicacies and also gives a lot of its history. 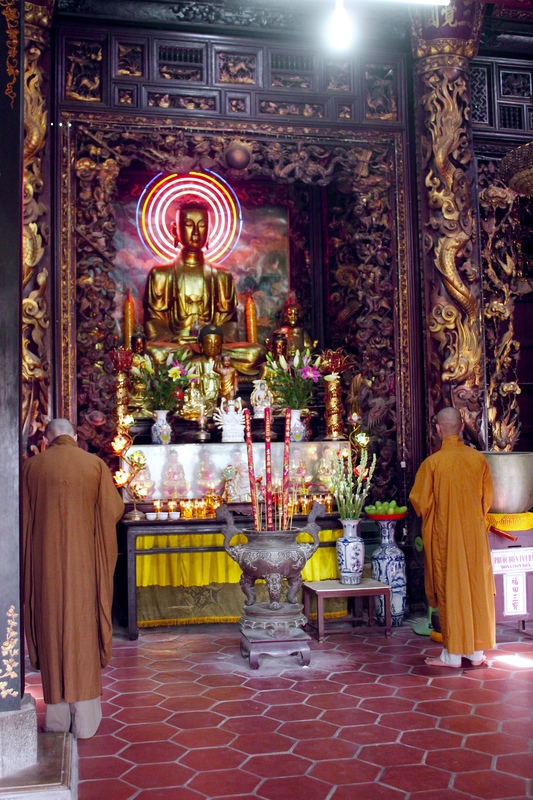 This is in my opinion one of the most beautiful cities in Vietnam with great historical value. It is located in central Vietnam and it used to be the capital of the country during its Nguyen Empire/Dynasty days (1802-1945). 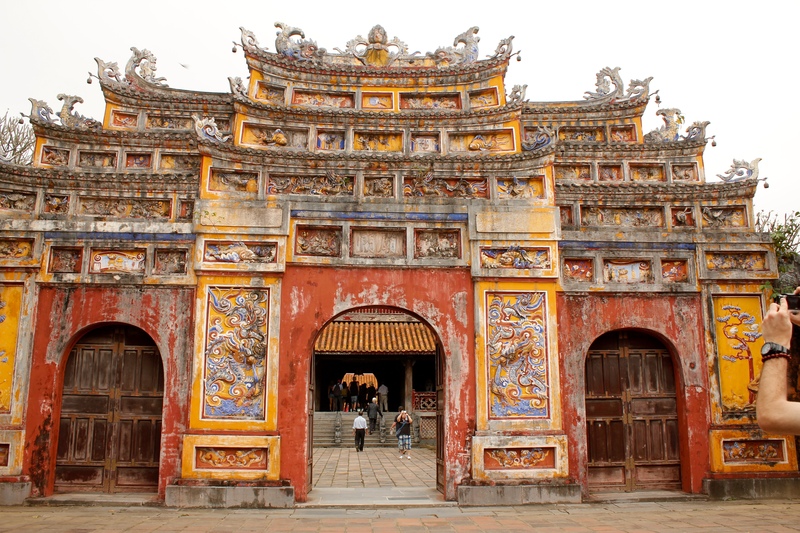 The biggest attraction is the Citadel enclosed by thick stone walls with the forbidden city, palaces and shrines inside. 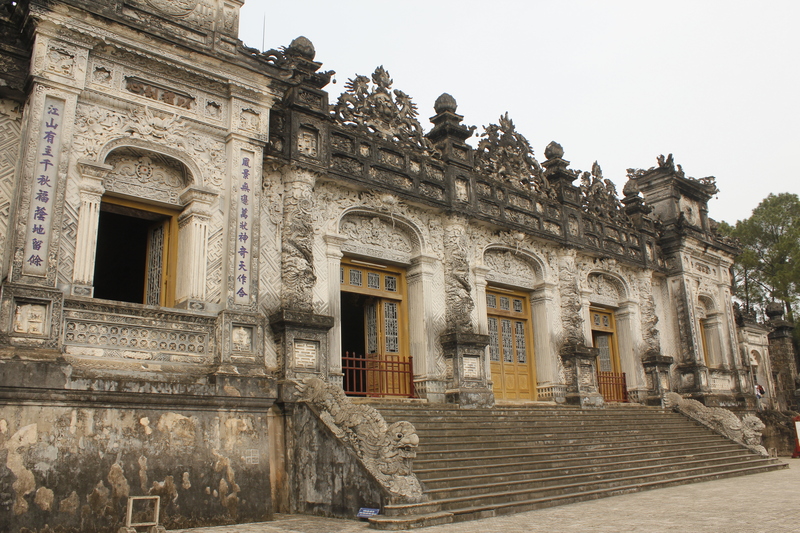 And just a few kilometers outside of the city you find the three most impressive tombs for the Emperors Khai Dinh, Minh Mang and Tu Duc. 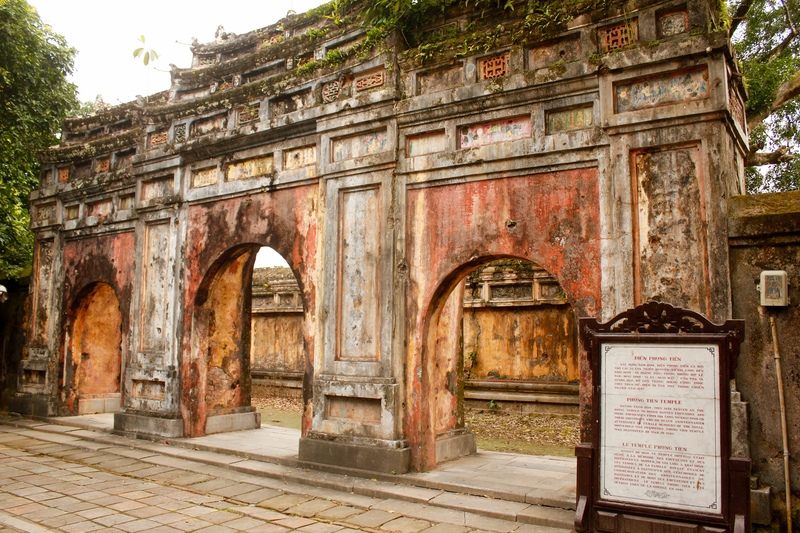 Emperor Tu Duc had no children to build his tomb after his death so he had it built himself while he was alive and he used the complex as his home. 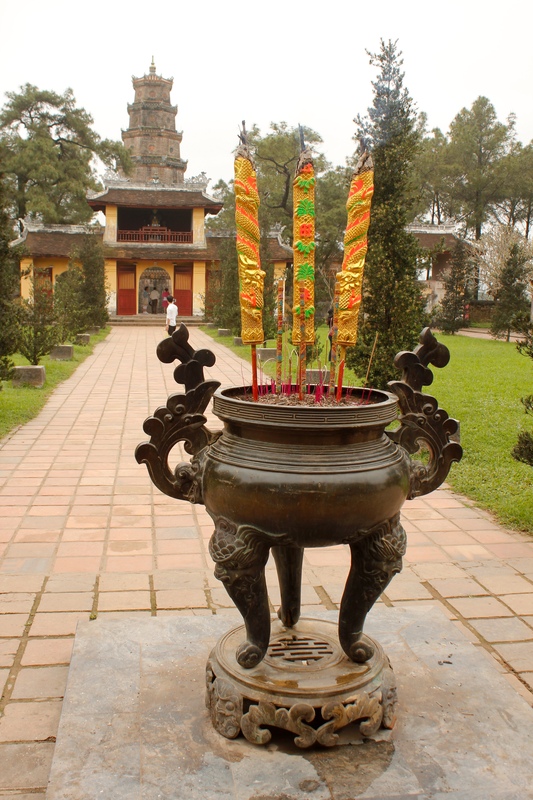 In 1968 during the Vietnam war (or American war as it is known in Vietnam) Huế was taken over by the Vietcong and North Vietnamese during the Tet Offensive. This was a very bloody street to street/house to house battle where approx. 13,000 people were killed including civilians and soldiers from both sides. A lot of the important ancient buildings were also destroyed. On a more positive note, the cuisine here is very special, defined by small dishes with a rather elegant presentation. I had to try a few… yum! banh Nam a mixture of fried ground shrimp, pork and scallions pressed, wrapped and steamed in banana leaves. Took the train to Nha Trang, a city on the beach, nice but a bit too touristy for me so I decided to continue to Dalat the following morning. The views out of my window in the train were pretty spectacular. 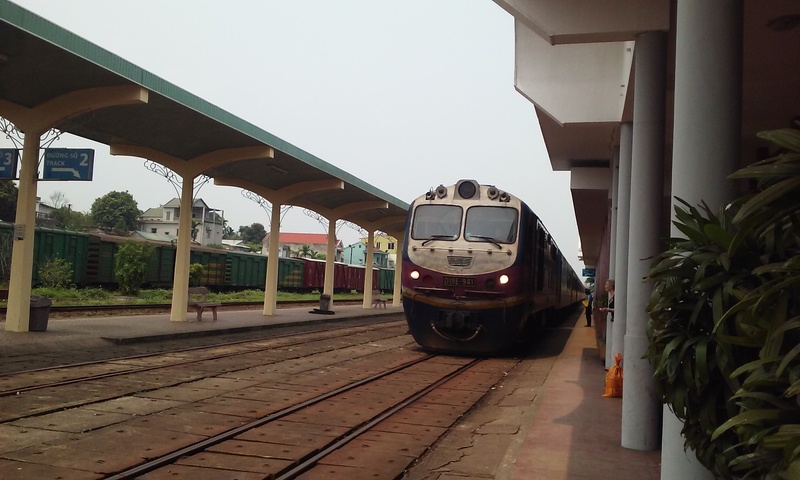 This is one of the routes that are recommended to do by train. 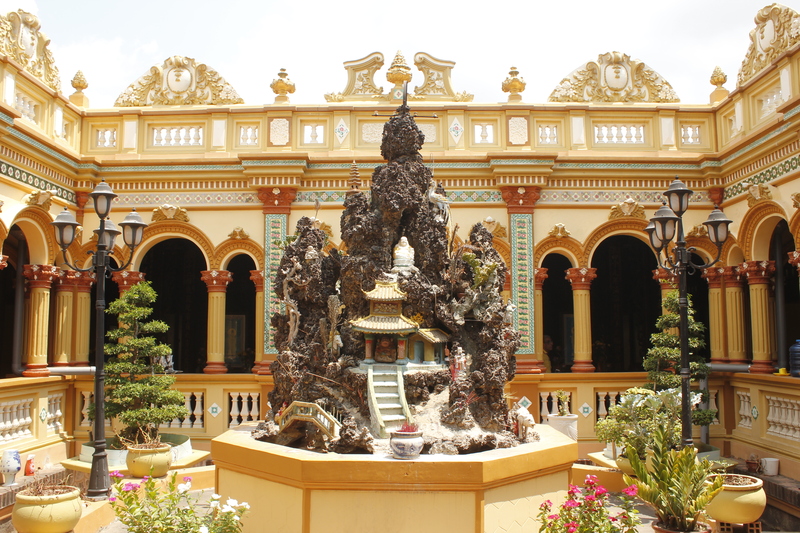 Dalat is a nice hill station with quite a bit of French influence as seen in some of its architecture and bakeries. There are beautiful hotels everywhere including the interesting crazy house; which I visited as part of an Easy Rider tour. Easy rider is a group of motorcyclists that take tourists around Vietnam on their motorcycles. It is perfect for people like me that want to see Vietnam on a motorcycle but not necessarily learn to drive one here. 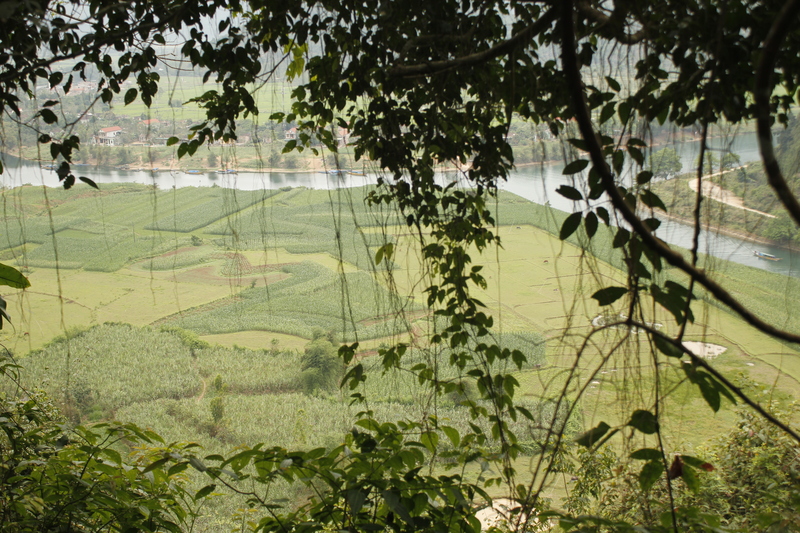 They are a very popular way of seeing the mountain areas around Dalat. Dalat is known for its cofee plantations. They are #2 in coffee production in the world, they beat Colombia due to their lower costs but.. we are still #1 in taste and quality! popular attraction in the city is the Crazy House built by Vietnamese architect Dang Viet Nga. typical scene in the mountains of Dalat, tons of motorcycles with backpacks strapped to them of tourist riders going up and down the country. 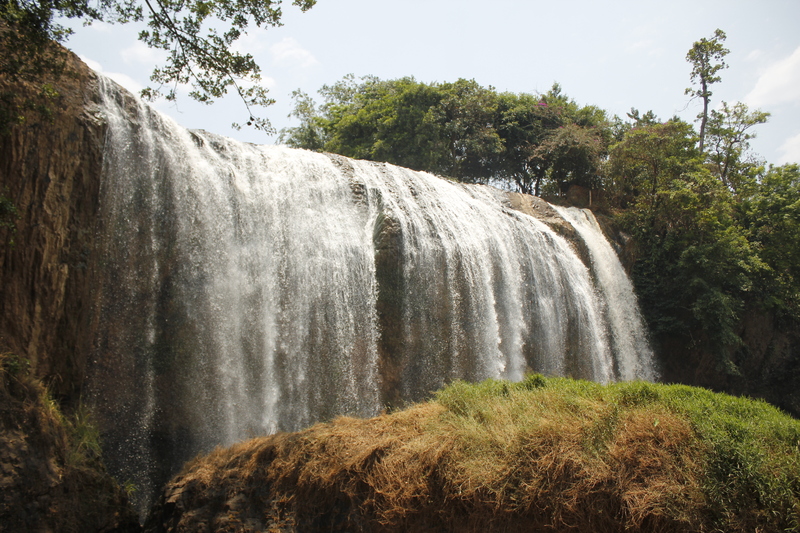 I visited the Pongour and the Datanla waterfalls. The Datanla falls are a set of three beautiful falls but they have become so touristy that there is an alpine slide to get to the first one, and a cable car AND elevator to get to the second one! You can visit the third one by joining a guided canyoning tour. Unfortunately I did not sign up for one as the weather got really bad. 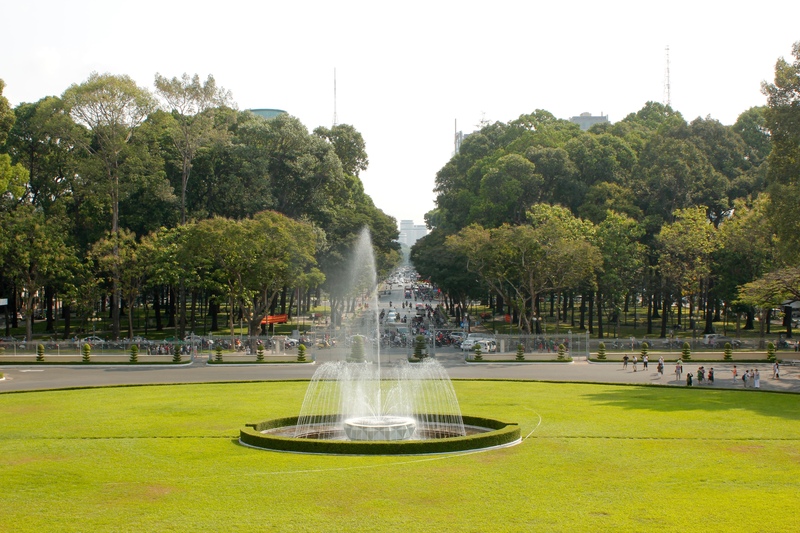 After Dalat I went to Ho Chi Minh city (aka Saigon). This city is crazy busy, even more so than Hanoi. I stayed in the old part; which caters to the tourists and backpackers… full of restaurants, bars, souvenir shops, massage places, and tour agencies that will book any activity for anywhere in the country. I joined a city tour that covered all the main spots. I often do these type of tours when I am in a big city so that I can cover all the main highlights and save a bit on transportation. We visited the General Post Office, the Independence or Reunification Palace, the Notre Dame Cathedral and the Remnants of War museum. Cu Chi tunnels- the day tour included a visit to the famous Cu Chi Tunnels, just like the Vin Moc tunnels, these were built by local villagers during the Vietnam war. There are a total of 250km of tunnels here, made in three levels that could house about 12,000 people. a local showing us how they went into the tunnels and covered all tracks again so the Americans could not find them. heading to the shooting range where we could shoot some of the weapons used in the war, including bullets left behind by the Americans. They still have a lot left 40+ years later!!! we crawled 60m through the tunnels, you definitely start getting claustrophobic after the first 20m! meet my partner for shooting the M16 and crawling through the tunnels- Muhammad Syukri from Malaysia. 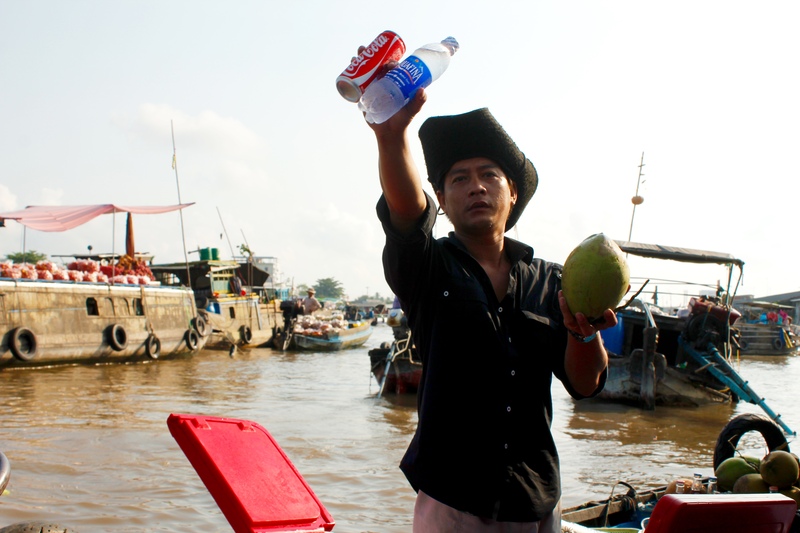 And for my final stop in Vietnam, Can Tho in the Mekong Delta. 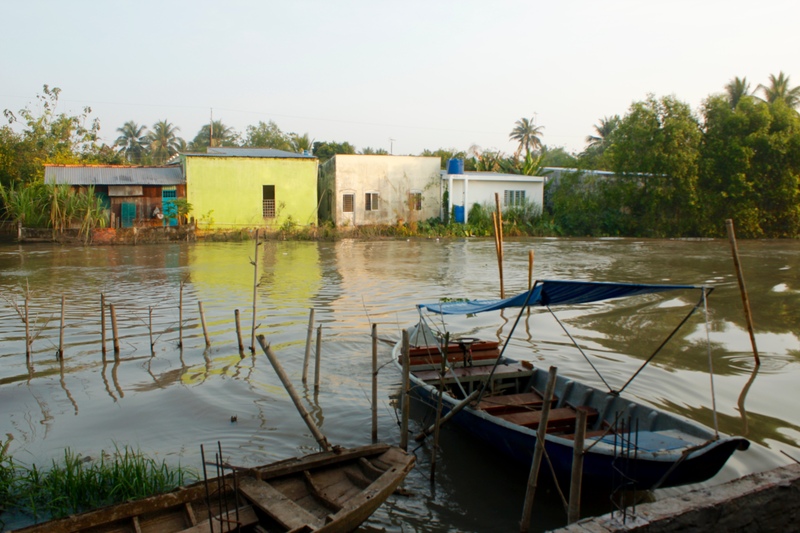 I joined a two-day trip to Can Tho; which is a city located on the south bank of the Hau River. 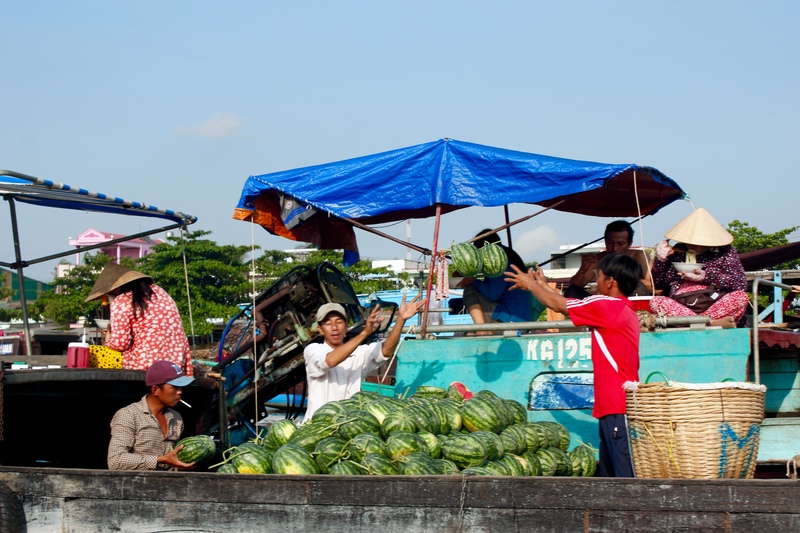 It is well known for its canals and floating market. 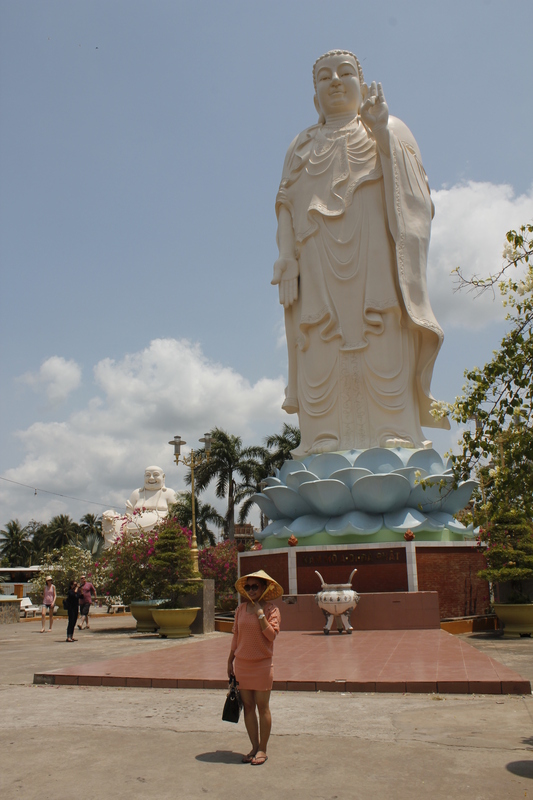 On the way there we visited the Vinh Trang Temple in My Tho with gigantic statues of the laughing Buddha, the reclining Buddha and the typical Hindu Buddha. We got there just in time for the monks chants and prayers inside the Pagoda. 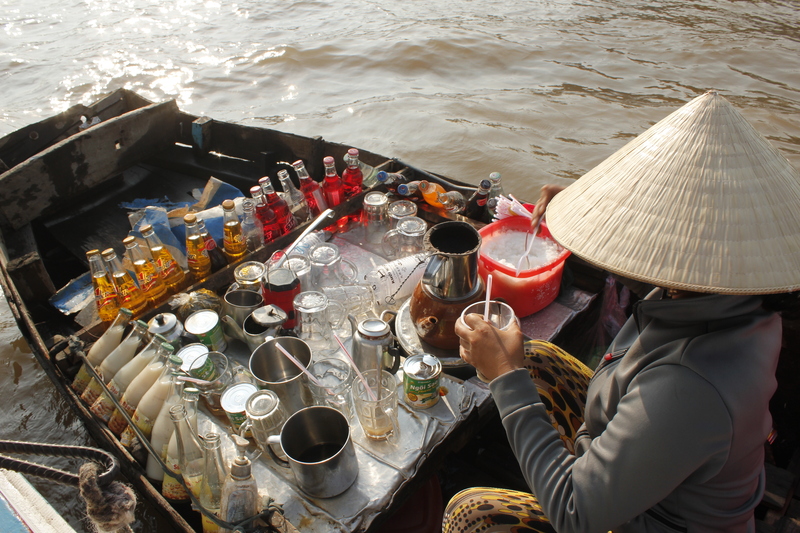 This is where I decided to buy my Vietnamese iconic hat; which I now have to carry around. It is so awkward and un-packable but I cannot seem to get rid of it! We took a ferry on the upper Mekong Delta, we visited a coconut factory and took a wooden boat down a small channel to visit a honey bee farm. 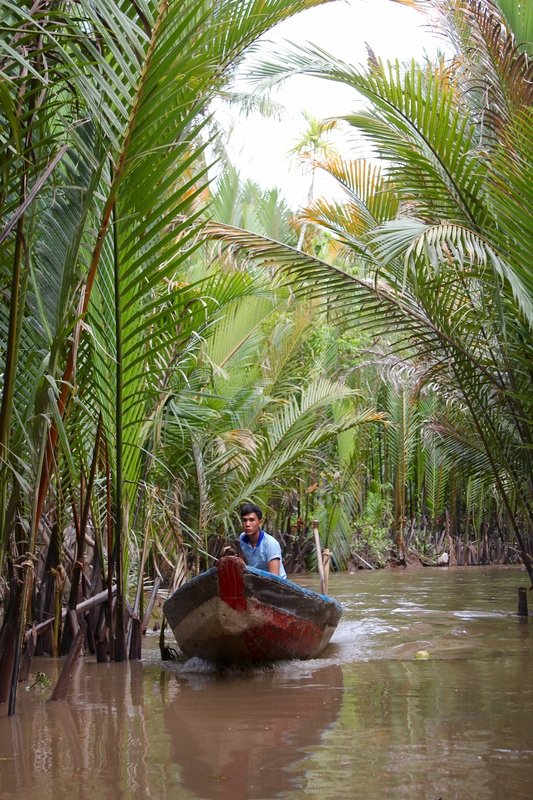 the beautiful water coconut trees that grow all along the river banks and sometimes in the middle of the river. Visited the Gua tree; which is 160 years old and considered Heritage for Vietnam. They have built a shrine here… very religious/spiritual site for villagers. I am such a tourist! The temple: I definitely recommend spending the night at a homestay, rather than a hotel in town. 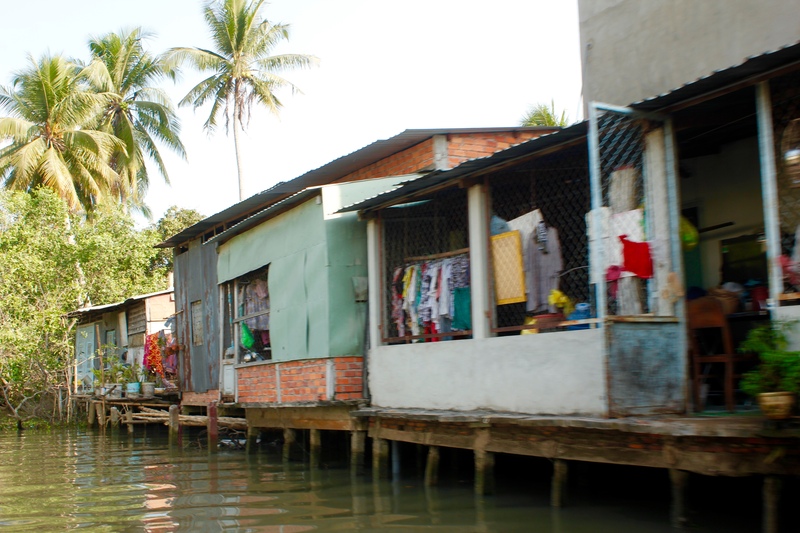 These usually have bungalows right on the river and offer cooking classes and rice wine for free! I tried grilled rat and frog at a nice bbq restaurant by the river. The rat was surprisingly delicious and even better than the frog! These rats are rice paddy rats, they only eat rice so they are pretty clean animals. We ended the night watching a magnificent performance of the AO show My Village at the Saigon Opera House. An hour-long show of acrobatics and musical/dance drama about life in a typical North Vietnamese village. Aaahhhh Vietnam! My time in Vietnam comes to an end. Six and a half weeks in what is now one of my favorite countries… so much natural beauty, great food, and amazing people. I take with me great memories and a great sense of admiration for the beautiful and resilient people of this land that have only known freedom and peace for 40 years but show no resentments and no grudges, and only know how to look forward! 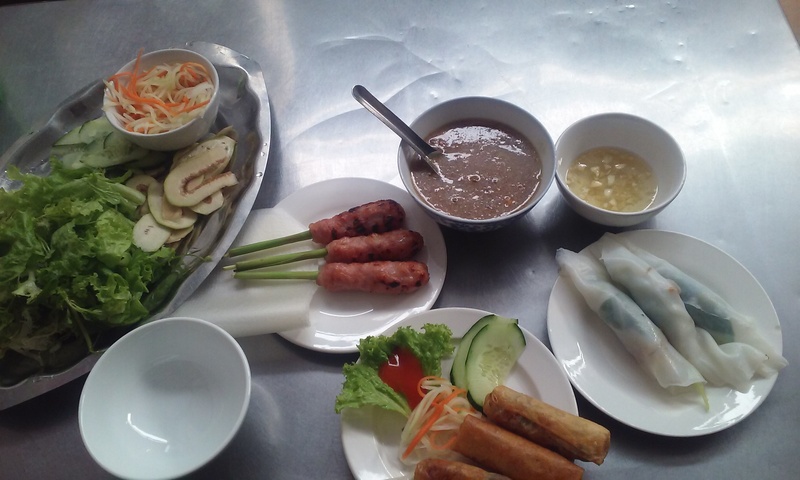 Cảm ơn nhiều Vietnam!